I’ve found that over the past couple of years, creepy Halloween items have been seen more and more in the retail and craft stores. I don’t know why, but I guess it comes down to this…people just like being scared and the thrill that’s associated with it. So my project “Bloody Pumpkins” is not for the faint of heart. Har har. It’s for those who like to live a little more on the dark side. I originally had the drip idea, but I thought fang marks would also make for a nice, spooky pumpkin (I was inspired by True Blood, but Twilight fans might appreciate this one as well). 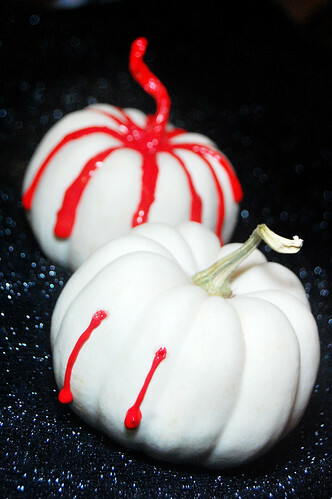 One could also create a cool pumpkin by spattering on the paint with a toothbrush for a Dexter-like blood spray effect. The more blood the better, eh? 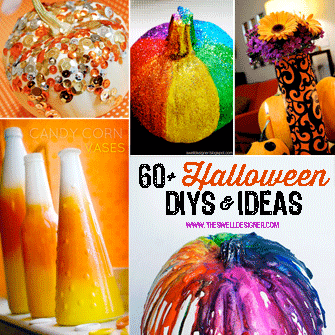 Check back all this week for Terrorific Tuesday and my 24 Halloween crafts in 24 hours. It will be a swell and spooky week with lots of fun and even prizes!